Home » BJJ Belts & Promotion » Do you have to do a test to get a belt promotion in Brazilian Jiu-Jitsu? No, belt tests are rarely required in Brazilian Jiu-Jitsu, though a few schools do them. Most instructors promote students based on their personal judgment. That’s not to say that instructors give out belts at random. Experienced instructors know what they are looking for in each student, even if they don’t explicitly state their requirements. Blue Belt – A good (if rudimentary) grasp of basic moves. Able to handle themselves well against white belts and some blue belts in sparring. Able to handle self defense situations against untrained people off the street (like headlocks and haymakers). Solid escapes and defenses. Doesn’t commit major mistakes like giving up positions or falling into submissions. Physically fit and able to complete several rounds of sparring. Commitment to training and regular attendance (it’s more important than you think!). Training for 1-2 years. Purple Belt – A very solid grasp of basic moves and the ability to use them in combinations. A more developed “game” that likely includes a good guard. A good sense of timing and fluidity of movement. Can handle all white belts and blue belts in sparring, and gives purple belts trouble. Training for 3-5 years. Brown Belt – An extremely solid game that doesn’t have any big holes. Able to impose their game in any situation. Can handle all lower belts in sparring, and gives brown belts and black belts trouble. Training for 5-7 years. Black Belt – A refinement of everything at brown belt. A depth knowledge and insight that comes from experience. 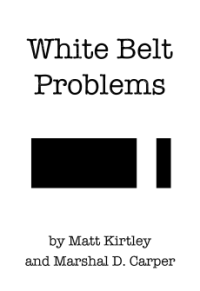 Able to handle all lower belts, and gives black belts trouble. Training for 8-10 years. Success in tournaments usually speeds up promotion at every belt level because it shows that the student is performing well against their peers, or that they are ready to go to the next level. An instructor may choose to hold back a successful competitor for other reasons though, such as a wrestler who wins through athleticism, explosiveness, and natural talent who still needs to improve their jiu-jitsu skills. An instructor may hold back a student for other reasons, such as poor sportsmanship, causing problems in the school, being a bad training partner, lack of discipline and self control, poor attendance, bad attitude, getting in fights outside the gym, etc. When an instructor gives someone a belt, that person carries the instructor’s name and reputation. An instructor may hesitate to promote someone who is “technically” ready but not a good representative for the school. An instructor could “sandbag” a student, which is to hold them at a belt level longer so they can win more tournaments. This is a controversial topic, because it has outsiders saying they know better than the student’s own instructor does when they should be promoted. The main criticism of sandbagging is that it is poor sportsmanship, especially at the lower ranks, and it’s done to inflate the instructor’s ego. The counter-argument is that the instructor just has different standards for promotion, or that they have reasons for not promoting that aren’t related to tournament performance (like the example of the athletic but underdeveloped wrestler above). The International Brazilian Jiu-Jitsu Federation (IBJJF) doesn’t require anything beyond minimum times at each belt, and that the student be at least 16 to get an adult belt rank. Those schools that do tests have different standards for them. Some ask for the demonstration of specific techniques at each belt test. Others ask that students show a certain number of techniques but they can choose which. Often the student is required to spar with different training partners, or do a marathon of sparring against every other person. It is often a given that the student is ready for their promotion, and these tests act as a rite of passage. Instructors who test will usually give the student notice and help them prepare for it.